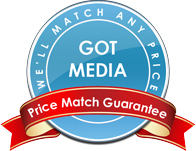 GotMedia.com is your one stop shop for all of your CMC Pro (formerly JVC & Taiyo Yuden) DVD-R media needs in Orange County, CA. JVC/Taiyo Yuden blank DVD-R media has been the exclusive choice of professionals since recordable DVD technology came to market. CMC Pro (Powered by TY Technology) DVD-R media is manufactured to Taiyo Yuden's strict specifications and quality control standards, and is a perfect fit for professionals that require the lowest failure rate, highest playback compatibility, and superior printable surfaces. Recognized by professional DVD duplicators, DVDR drive manufacturers and consumers alike as a premium brand. Taiyo Yuden brought high-speed DVD-R and DVD+R to market in 2002 with 4x record speed. Today's record speed for DVD R media is 16x. Taiyo Yuden's reputation for high performance and reliability is evidence that they make an excellent DVD R. Mainly used by professionals, CMC Pro (Powered by TY Technology) DVD R is quickly becoming the choice among consumers as well. This can be attributed to the praise that CMC Pro / Taiyo Yuden DVD-R receives in blogs and forums across the internet. DVD R is a format that is generally more sensitive than CD-R and for that reason it is highly recommended that you stick with quality brands like CMC Pro. CMC Pro DVD R is sure to perform throughout the production process and all the way through to the end user selecting "PLAY". CMC Pro (powered by TY Technology) manufactures a full line of bulk and printable surface blank DVD-R media. Available in shiny silver top (bulk), White Inkjet Printable, Silver Inkjet Printable, White Thermal Printable for monocolor and color thermal printers Prism, Prism Plus, Everest, Teac P-55 and more. Please also be sure to check out our line of Taiyo Yuden CD-R Media and CD DVD Printers products as well!